This week’s blog post is totally different. Thanks to the Twitter gods and goddesses, I was approached to collaborate with a super cool Canadian mental health organization called Wear Your Label (WYL). If you don’t know, WYL is a conscious clothing line that aims to bust mental health stigma by starting conversations about mental illness through clothing. 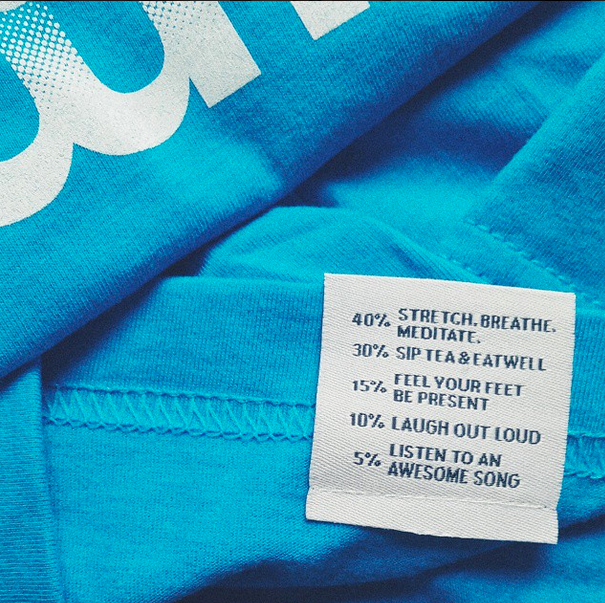 Their garments are designed to help consumers feel connected with their own story by using positive messages like “it’s okay not to be okay” and garment tags that teach you self-care. For WYL it’s more than just about clothes, 10% of profits go back to mental health organizations. Wear Your Label has appeared in MTV, Cosmopolitan, Seventeen Magazine, Buzzfeed, Bustle, and The Today Show among others, and now Kayley and Kyle are gracing us with their presence to do a little Q&A on Mad Girl’s Lament! So my mad lovelies, give them a warm welcome (virtual wave!). Why did you choose clothing as your vehicle to busting mental health stigma? Kayley: We both love fashion and we’re passionate about mental health, so the idea kind of came about organically and just made sense to us. We realized there was a gap to be filled in both these industries, and Wear Your Label could fill it by raising awareness,doing good, all while being stylish. Kyle: Often times the fashion industry makes you feel something and those feelings are generally ones of insecurity and vulnerablity. Clothing isn’t suppose to make you feel fat or second guess yourself – its suppose to make you feel amazing. We at WYL found that there is a huge gap between how fashion can be used as a force for good. The best example would be a message we received yesterday; “sometimes my clothing has to say what I can’t.” That’s exactly what we want to do with our clothing; create conversations, community, and care around mental health. One thing that I find really cool is that you don’t retouch any of the photos – product shots or look books – why is that so important to you and how does that advance WYL’s mission? Kayley: I have some experience modelling, I’m represented by an agency here in Canada. So it’s something I’m pretty familiar with; I’ve been on the other side of the camera and seen the gorgeous images that come out afterwards – but they’re not me, and it’s an unrealistic representation of who I am. So many people don’t realize the hours of retouching work that goes into fashion images, and yet we all feel insecure about ourselves, and compare ourselves to those stunning magazine covers and editorials. I’ve struggled with acne, and bodies image issues with my eating disorder, and so it was both a branding decision, but also an important personal decision from the beginning to keep models untouched. Kyle: I think for me anyways, honesty is really important. Especially, when we are advocating to have real meaningful conversations to eradicate stigma around mental health. Moreover, we feel that it’s important to show people as they are not what we want them to be. We love our Role Models for who they are, and who they aspire to be not who we photoshop and paint them into perfection. We want our followers and customers to feel empowered when visiting our webpage, not insecure. Why do you think few people are talking about mental health? Is it just stigma or is it something more? Kayley: I think stigma from society is a huge reason. There’s a misunderstanding of what mental illness is, what it looks like, who is or can be affected, but I also think stigma from within is another issue. I remember being at my lowest with my eating disorder, and feeling so ashamed and judgmental of myself. When you feel those things towards yourself, let alone how others feel, you’re really unlikely to reach out or talk about it. With Wear Your Label, we’re trying to crush both those stigmas: helping mental illness become something more visible in society with a positive connotation, but also helping individuals feel more comfortable with who they are, like with small details like our “Self-Care” tags, which are sewn into every garment and give our consumers tips on how to turn their day around. Kyle: Mental Illness is invisible. People have a really hard time understanding something they can’t see or identify with. If you break your arm you get a cast and its a symbol to the world that you’re hurt, but at the same time you are healing. Whether people recognize it or not they accept it and move on. There is no cast for mental illness and people aren’t just healing but living with their mental illnesses. We, at WYL, with our clothing try and replicate the cast idea. Our clothes are a way to show the world that yes, you might have a mental illness but you are healing and getting help. 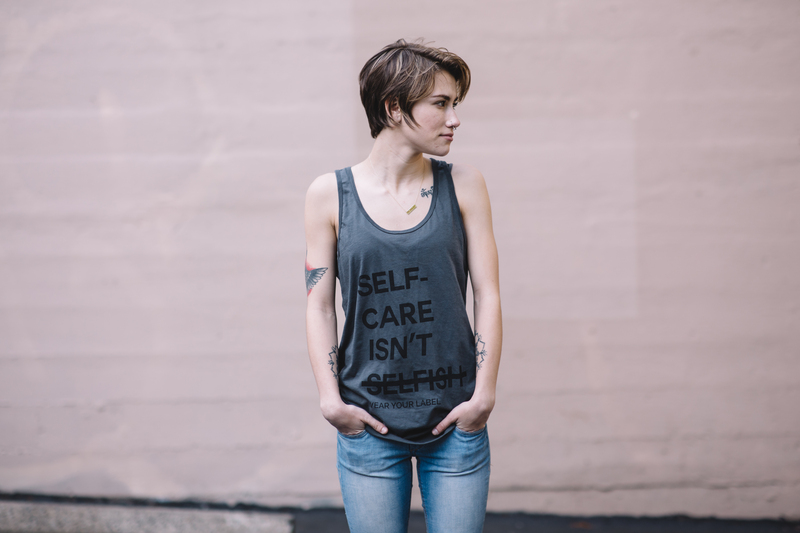 One of my favourite t-shirts is one that reads “self-care isn’t selfish” on it. What do you do for self-care? Kayley: I’m a big fan of tea, downtime alone, and pampering! Nail polish, face masks, and other super girly things always make me feel so comfortable and refreshed. Kyle: I love watching movies, playing sports with friends, or working on new clothing ideas for WYL. Many people would see having a mental illness as an obstacle, but you have seemed to use it as a spring board to create a unique and socially conscious business. Do you have any words of advice for those of us struggling with mental illness? ​Kayley: It sounds so cliche, but you are not alone and things do get better. Not all at once, not over night, and it’s not easy, but with hard work, persistence, and the right support – it is so possible to overcome whatever you may be struggling with. If we can make it through, so can you. Kyle: I think the best advice I have ever received is; “You cannot help others until you first help yourself” We really do try and advocate that through our work at WYL by making sure both Kayley and I are mentally healthy so that we can properly connect with people who reach out to us that may be struggling with their mental health. On May 20, WYL is launching a Kickstarter campaign to raise $25,000 so that they can expand their team, and meet manufacturing minimums for our Fall/Winter line. And like most Kickstarter campaigns, there are always supporter rewards! Talking about super rewards, want your very own chance to buy your own Wear Your Label gear? I’m giving away a $30 promo code for Wear Your Label. Enter today! Contest runs until May 31st. Amazing! I love the clothes and the story behind this venture! Amelie – that’s great that your friends are supportive. It helps so much! I absolutely love everything that Wear Your Label stands for an does for the mental health community! Same here that’s why I was so excited to collaborate with them! Good luck on the draw & I hope you’ll stick around for more posts. I love how they’re ending the stigma, finding a way to end the stigma is so incredibly important and they’ve found a way to start the conversation! And it’s a stylish way to start the conversation! 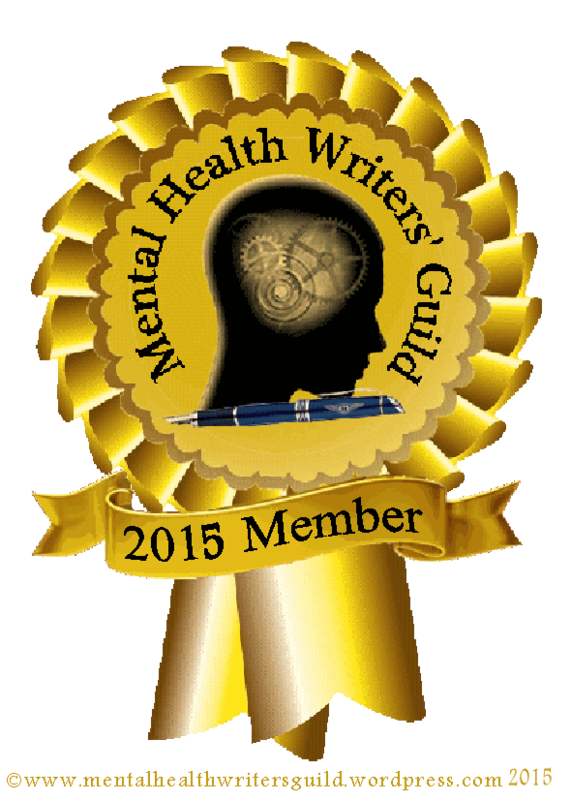 Good luck on the draw & I hope you stick around to read more about mental health! I believe it’s important we continue to talk and be open about how we feel and our struggles. The moment we begin to be quiet is the moment it becomes so deadly. Keep strong! A couple weeks ago I was talking with my counselor and was telling her how I felt as though “my daughter deserves so much more of a mother.” And my counselor replied “No, she deserves a mother that is going to show her that you can get through this … And you will.” Yeah … She’s pretty wonderful. My counselor and my little girl. Keep talking … Keep up the honesty and push any embarrassment to the back. Thank you (so much!) Wear Your Label for helping us to feel better in our own skin … With our own minds. Thank you for stand up for us! Busting stigma is so important to me. Thank you so much for reading and I hope you stick around for other posts. Good luck on the draw! I love the idea of this! It’s wonderful that young people are using these issues as a springboard to spread awareness in a way that will get people’s attention. Definitely became a fan just now. Thank you for sharing this on your site and spreading awareness of this great business! Can I just say I want everything on the site now? So awesome!!!! I made my own shirt that said “I have depression” and wore it for a few days with overwhelming support 🙂 such a great initiative! Thank you for improving mental health education! I love that you made your own shirt!!! Very cool. Good luck on the draw for the $30 promo code! Kayley and Kyle are amazing! So proud of everything they’ve done and so honoured to know them through jack.org. Amazing!!! So glad to see mental health organizations working together.